Over the years, I've seen my photos used in many different places. 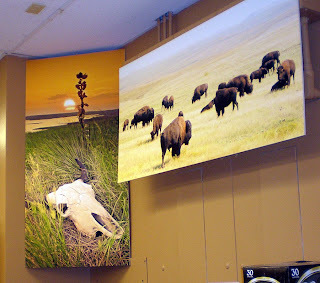 The National Museum of Wildlife Art in Jackson, Wyoming and on a semi truck headed for relief efforts in New York City after the 9-11 terrorist attacks are a couple places I never expected to be exhibited. Now I can add the liquor store at Lynn's Dakotamart in Pierre, South Dakota. The management felt that showing off the region around Pierre would make an attractive display for the store. 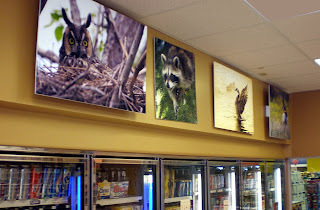 Now locals and the many visiting fishermen and hunters are surrounded by these images while shopping. 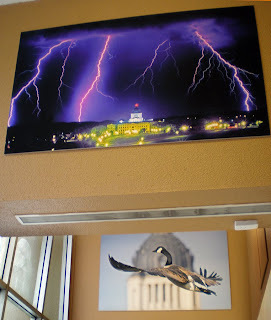 So if you're in the Pierre area, stop in Dakotamart and check out the exhibit. It's better than anything I would have put together myself. That looks really nice. It's always especially nice to see good photography in the most unexpected places. Tricia, I look forward to seeing great South Dakota images on your site as well. It's been a great week.